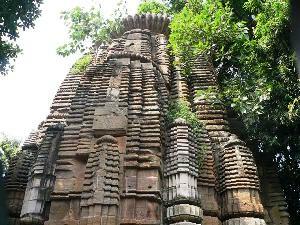 Mohini Temple situated on the south bank of the Bindu Sarovara, the 9.45 metre high Mohini temple of Bhubaneswar, in its architectural feature bears a close resemblance to the Parasurameswar temple. The Jagamohana had fallen into ruins in course of time and has been restored recently. Mohini literally means the temptress. But Chamunda, the presiding deity of the temple, hardly looks the part. She is carefully modeled as a ten-armed tantric version of Kali and presented in a dancing pose in her terrible best. A six-armed image of Mahisasuramardini (she who crushed the demon Mahisasura) lies on the floor of the Jagamohana. The usual group of parsva-devata such as Parvati, Kartikeya and Ganesha adorn the temple though many carvings were left unfinished in the temple.